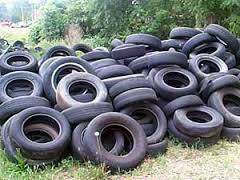 Scrap tires are used in a number of productive and environmentally safe applications. From 1990 through 2003, the total number of scrap tires going to market increased from 11 million (24.5%) of the 223 million generated to 233 million (80.4%) of the 290 million generated. Many uses have been found for recycled tires including whole tires, tires chips, shredded tires, and ground rubber. Retreading also saves millions of scrap tires from being disposed of as scrap each year. For residents of Delaware County only.